The first volume of The Syndicate Master Plan draws to a close with Guy Adams’s ‘The False Guardian’ as the TARDIS lands on a desolate world that the Doctor finds hauntingly familiar. Inside a strange complex an enigmatic director heads dangerous experiments, and the Doctor and Ann soon find themselves part of a diabolical scheme that forces the Doctor to confront his past and a foe long presumed dead. Where ‘The False Guardian’ excels is in showing just how comfortable the Doctor and Ann are with each other despite just how fundamentally different their approaches are. Whereas the Doctor is content to wander around space and time with no urgency or direct purpose, Ann has taken it upon herself to look into the TARDIS data banks with K9’s help to find out as much as she can about the Sinestran Syndicate, going so far as to find the coordinates of a planet that seems integral to the greater plan she unwittingly found herself part of on a smaller scale back in ‘The Sinestran Kill.’ This more immediate approach, of course, would become more commonplace with the Doctor’s future incarnations and especially in the modern televised series, but it takes the Doctor off guard here and puts him in the unfamiliar position of having his actions dictated, a seldom seen facet that Tom Baker plays wonderfully. Naturally, the planet quickly presents a number of strange phenomena and dangers to the travelers, and the presence of the deadly Varga plants suggests a link to Skaro while the atmospheric chronal radiation hints at a dangerous weapon or time experiment in the past. This exploratory component is filled with wonderful visuals and a tense atmosphere that sets the scene expertly while subtly providing links with ‘”The Daleks’ Master Plan” that the title of the story rather overtly gives away, but it’s within the strange complex on this world of Kembel that the narrative begins to unravel to some extent. While there’s no doubt that the second half of this two-part story will more directly tie into the Syndicate story, there is simply too much padding and deflating misdirection to hold attention and maintain excitement throughout. As stated, the title absolutely ruins the cliffhanger to the first episode, and even the story seems to realise it when the grand reveal is promptly proven false and treated with little more than a scoff in the opening seconds of the second. 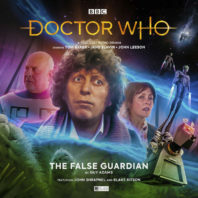 In fact, vast portions of ‘The False Guardian’ seem somewhat uncertain about how to fill their allotted time until reaching the eventual true climax that acts as the mid-series finale. This underwhelming sense is particularly strange because there are many genuinely intriguing figures and actions within this facility that appears to be a sort of health spa for the universe’s weary elite. There is a nice dichotomy between the general appearance of normality at this locale headed by Anna Acton’s incredibly stressed Deputy Director and the screams often heard in the background as Blake Ritson’s Elmore acts so nonchalantly, but too much of the story is played more lightly than the serious events suggest and thus fails to fully allow these horrors to reach their full potential. There are certain times in which the Fourth Doctor’s particular flippancy can heighten a dangerous situation, but the tonal mishmash within this facility only dilutes this aspect of the character as well. It’s hard to overstate just how detrimental the treatment of the false reveal is on this story as a whole while centering the title around it, turning misdirection into pure filler with no real buildup beyond the setting outside and- at least at this point- having no real purpose or gravitas. Instead linking a false Mavic Chen into the story of Zephon, an equally important character from “The Daleks’ Master Plan” with ties to the Doctor but a character who has nowhere near the legacy of the Guardian of the Solar System, risks alienating more casual fans not intrinsically familiar with that epic serial that began broadcasting over fifty-three years ago. A story of this nature naturally relies on its second half to come to an adequate conclusion, and it’s wholly possible that the seeming missteps of this one will be rectified in the process, but it’s going to take a very charismatic and well-rounded villain with a strong backstory to do so, one who should have been introduced much earlier here rather than prolonging focus on everything else.